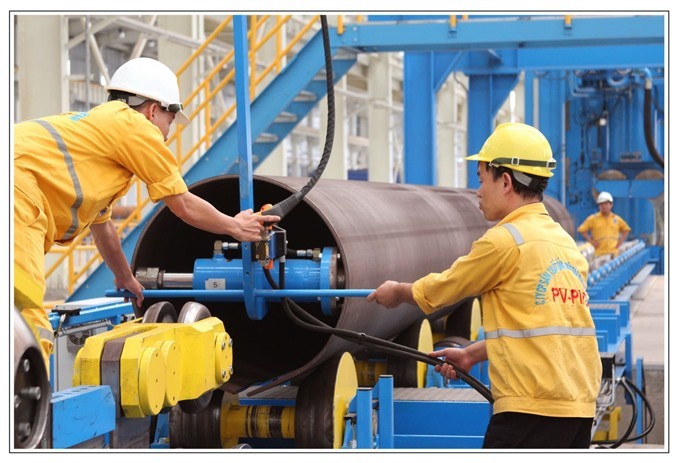 HÀ NỘI – Shareholders of PV Gas (GAS) has approved the company’s plans to lower its business targets in 2017 by 15-27 per cent year-on-year, given the global instability and volatile oil market. This decision was made in PV Gas’s annual shareholders’ meeting yesterday. The biggest listed energy company has targeted total revenues of nearly VNĐ51.5 trillion (roughly US$2.3 billion) and net profits of VNĐ5.3 trillion in 2017, down 15 per cent and 27 per cent, respectively year-on-year. The proposed numbers are based on its estimate of average global oil price of $50 per barrel this year. The company reported it earned about VNĐ16 trillion in revenues and VNĐ2.7 trillion in pre-tax profits in the first three months of this year, equivalent to 30 per cent of its revenue target and 41 per cent of its profit goal set for the whole year. “Based on the first quarter performance, the targets set for 2017 will likely be accomplished and even be higher than the plans,” said Lê Quyết Thắng, a member of the managing board, at the meeting. Thắng said oil prices heavily depended on demand and supply and with increasing demand this year, global oil prices were forecast to average at $56 per barrel. In the long term, oil prices could climb to $87 to $90 per barrel by 2020. GAS shares was up 0.2 per cent yesterday, settling at VNĐ54,000 ($2.37) a share. The shares have lost roughly 11 per cent in value this year. In 2016, PV Gas posted total revenues of over VNĐ60.5 trillion, up 14 per cent over its yearly plan, while its net profit surpassed the annual target by 38 per cent to almost VNĐ7.2 trillion. The company raised its dividend rate to 40 per cent on 2016’s performance, while it keeps the rate of 30 per cent for 2017’s dividend. In the face of global instability and slow recovery in the world economy, PV Gas will focus on upstream activity to ensure stable gas sources. It is investing in gas collection projects, including Nam Côn Sơn 2 Gas Pipeline, Sư Tử Trắng (White Lion) and Cá Rồng Đỏ (Red Emperor) gas fields, and Sao Vàng-Đại Nguyệt offshore projects. These projects are expected to be completed between 2019 and 2020. PV Gas has plans to hike its holdings in PetroVietnam Northern Gas Joint Stock Company (PVG) and Southern Gas Joint Stock Company (PGS) from the current 35 per cent to 51 per cent in each company. Both companies are listing shares on the Hà Nội Stock Exchange.